alaTest has collected and analyzed 645 reviews of Samsung N220. The average rating for this product is 4.2/5, compared to an average rating of 4.1/5 for other products in the same category for all reviews. Reviews about the design and portability are on the whole positive. The battery and usability are also appreciated. There are some mixed opinions about the touchpad. We analyzed user and expert ratings, product age and more factors. Compared to other products in the same category the Samsung N220 is awarded an overall alaScore™ of 85/100 = Very good quality. The Samsung N220 features an unusual glossy colour lid; we think it achieves a nice balance between work and play. The glossy finish will attract plenty of fingerprints, however. We like the Samsung N220's built-in 3G wireless broadband capabilities, but its impressive design will also win its fair share of fans, as will its excellent battery life. Samsung have gone through the motions here at Laptop-Review.eu yet again, and they do not usually disappoint. We have waited for this particular model with baited breath, a model that has indeed proved popular with users. 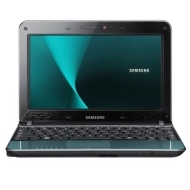 Samsung N220 is exactly what a netbook should be. It focuses on all the right aspects and is quick enough so as not to make you impatient. Samsung's netbook uses Intel's second-gen Atom processor to boost battery life. Subwoofer makes an actual difference to sound quality. Quad-band WWAN should connect to any Australian network. Three USB ports. Excellent keyboard. Two-year international warranty. Only 1GB RAM. 1024x600 screen. Low-level networking still a netbook staple.